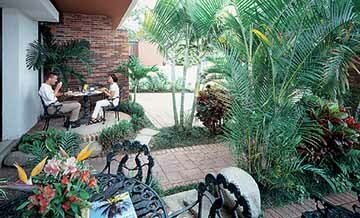 The Barcelo Rincon del Valle is a small quaint bed and breakfast style hotel in Sabana. 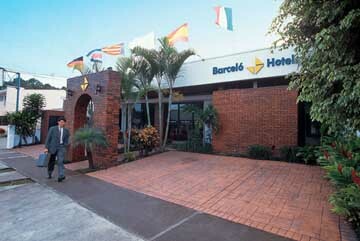 The hotel was opened in 1994 and has maintained an excellent reputation for providing convenient lodging and excellent amenities. The hotel is located next to Parque La Sabana and near to Escazu, Pavas, La Sabana, La Unaca, Sanata Ana, Paseo Colon, Barrio Corazon de Jesu. Within walking distance of stores, restaurants, night clubs and entertainment. The Rincon del Valle Hotel has 20 rooms, styled as a bed and breakfast and is open the year round. Available amenities include: cafeteria for breakfast, sandwich and drink services, laundry service, courtesy coffee, parking, mini-bar, post and fax, money exchange and excursions. The rooms have cable TV, radio-alarm clock, direct dial phone, in-room safe deposit box, air conditioning, full bathroom, hair dryer, coffee marker, desk, closet and 24-hour service. The Hotel Rincon del Valle is maintained in the same impeccable style as all Barcelo Hotels, Resorts and Casinos. This intimate bed and breakfast style lodge is conveniently located in town. You are a short distance from the museums, metropolitan park La Saban, the historic squares and daily tours to the different National Parks and Vulcans at the Central Valley. Included with your stay at the Rincon del Valle hotel is access to the swimming pool, gymnasium, Jacuzzi and casino at the grand San Jose Palacio Spa and Casino. Shopping for Costa Rican craftsmanship is a varied experience. A wide variety of goods which reflect the country's typical traditions and features, ranging from replicas of pre-columbian objects or the traditional Costa Rican cart up to the modern, elegant designs. Wood and clay sculptures, pottery, leather goods, jewelry and wickerwork are also to be found. Articles can be bought in the center of San Jose. The Rincon del Valle Hotel is conveniently located to the international airport and close to the center of the city. The weather averages at 85 degrees F. Whether your visit to Costa Rica may be for pleasure, relaxation or business... a Barcelo Hotel and/or Resort is ready to accommodate you.